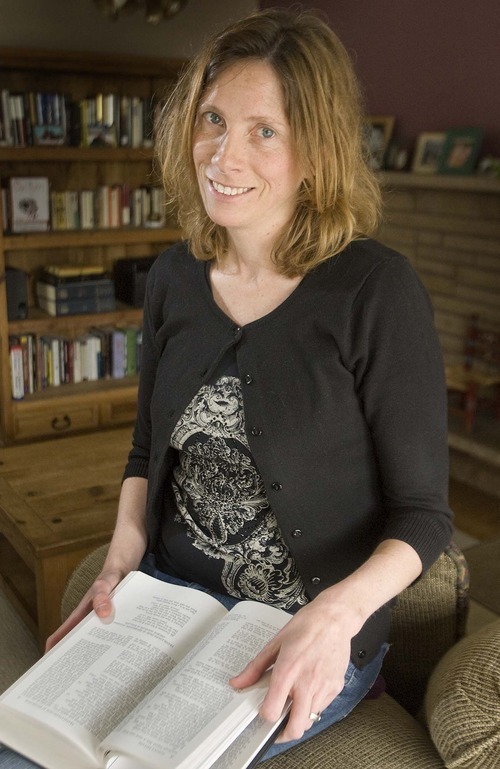 Utah writer • Kimberly Johnson's hard-edged, idea-oriented verse wins prestigious fellowship. Paul Fraughton | The Salt Lake Tribune Kimberly Johnson, who is a recipient of a Guggenheim award for poetry, at her Salt Lake City home on Tuesday May 3, 2011. Paul Fraughton | The Salt Lake Tribune Kimberly Johnson, who is a recipient of a Guggenheim award for poetry, at her Salt Lake City home on Tuesday May 3, 2011. Salt Lake City poet Kimberly Johnson runs for inspiration seeking "physical expressions that find sonic counterparts in words." If she writes just one line of verse per week, she considers it a "fast pace." She's interested in "the slippage" of what language can and can't do. And the 40-year-old associate professor of English at Brigham Young University is more interested in the hard work of "principles, theories or ideas" than "gentle, little souls." Poetry, she says, "should stimulate the heart, body and mind all at the same time. If it ignores even one of those, it falls flat." A tall order, to be sure, but it's a standard that has served her well. A Renaissance scholar and translator as well as poet, Johnson has two published collections of poetry to her name, a translation of Virgil's Georgics published this year by Penguin Classics, as well as a National Endowment for the Arts award. As of last month, she can now add the laurel of a John Simon Guggenheim Foundation fellowship in poetry. The Yale Review praised Johnson's second book of poetry, 2008's A Metaphorical God, saying she "writes with Milton open at her elbow but with the real dirt of a real Utah under her fingertips." The prestigious fellowship adds Johnson's name to a very short list of Utah residents who have received the award in the past. Logan native and poet May Swenson received a Guggenheim in recognition of her poetry in 1959. Jacqueline Osherow, professor of English at the University of Utah, received the Guggenheim in 1997. The foundation announced its 180 awarded fellowships across 62 scientific, academic and creative disciplines April 7, selecting from some 3,000 applicants. The awards were established in 1925 and have distributed millions of dollars' worth of grants that allow recipients to travel and fund individual projects. Ten recipients of the award for poetry were announced this year. Johnson's mind first opened to the power of language growing up in West Jordan, where she listened to songs by Daniel Lanois and Chris Whitley. "I obsessed over rock lyrics as if they were works in themselves," she said. "Then I slowly became indoctrinated by poetry that wasn't accompanied by loud guitars." 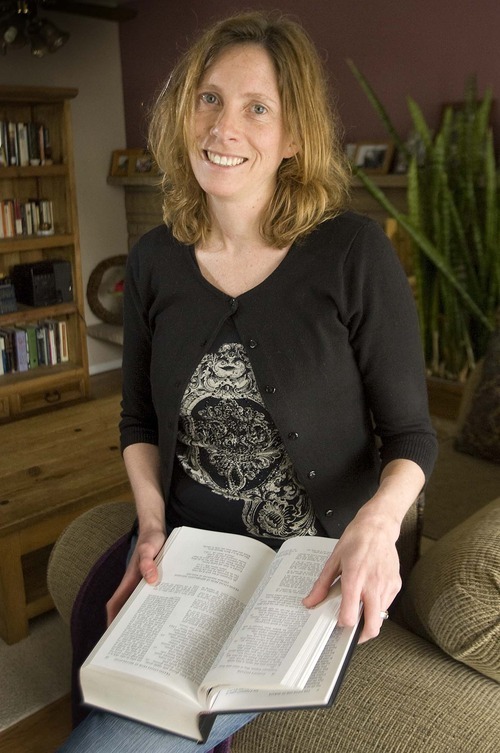 Johnson credits her West Jordan High School teacher Steven Bickmore, who helped steer her in the right direction in Advanced Placement classes in Latin and English, pointing out the link between the study of classics and English poetry. Bickmore is now an assistant professor of education at Louisiana State University. "She used to leave me messages in Latin on the blackboard that were often over my head and difficult to translate," Bickmore said. "She is one of the students I tried to remember when teaching high school got rough - as it always does. As I work at LSU teaching new English teachers, I try to tell them that, yes, some of your students will listen." Johnson went on to earn a master's degree at Johns Hopkins University, an MFA at the University of Iowa and a doctorate in 2003 from the University of California at Berkeley. Returning to Utah was never an end-goal, Johnson said, but a happy accident. She greeted the announcement of her award last month with "complete astonishment." She was talking via Skype to her husband, Jay Hopler - a poet currently living in Rome on a fellowship from the American Academy of Arts & Letters - when she opened an e-mail from the Guggenheim Foundation. She ended the conversation without telling her husband about the award. After a chance to collect her thoughts, she called him back to relay the news. Her two sons, 10-year-old Elijah Greenfield and 6-year-old Bennett Greenfield, jumped up and down in the family living room. "They didn't know what the award was. They just knew it was something to celebrate," Johnson said. Johnson plans to use the $40,000 fellowship award to take time away from teaching and finish the last five poems needed for her third collection of poetry. Sample some of the poet's award-winning verse at http://www.kimberly-johnson.com.